I hope that many are excited about the early planning stages. This has not been done before, nor has anyone in the City presented anything remotely near to this type of proposal. I believe this will be a tremendous benefit to our City to give us a realistic view of options that will fit our needs for Rescue/EMS services. To help us avoid pitfalls to laying things out of how to transition to a City-owned Rescue/EMS Department with the best ISO rating. I look forward to the upcoming Citizen’s Survey. I would love to hear anyone’s thoughts on the proposal presented to say yes, that you would want to volunteer on this Search Committee. You can learn more about the expectations of the Search Committee in the presentation and review the upcoming “Scope of Work”. Keep in mind the Citizen’s Survey is a common practice to improve in city planning, engagement, and improvement of services. We are always looking for solutions and great ideas. The survey is not an attempt to cause division so please use this as an opportunity to let your voice be heard. Page 7 – 22 of the presentation shows visuals of comments that came directly from the 2016 Citizens Survey. As a newly elected Council Member, I wanted to make it clear that I am not going to support anything or vote to pass something that goes against what the majority wants. Your safety is also absolutely my concern. Through research from reading gobs of pages of handbooks about Fire Districts to City Management contracting services, I believe a case study is needed. It will remove these types of issues with future service agreements for public safety services. 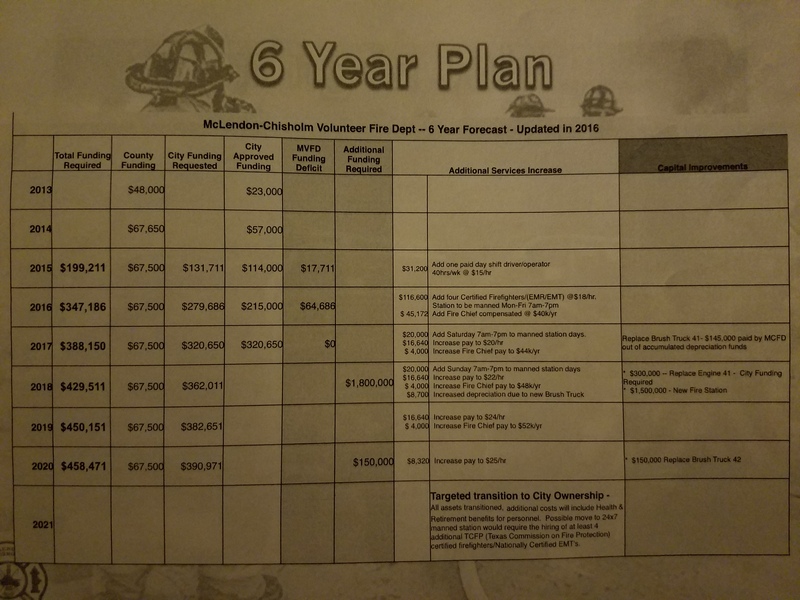 The above images is a copy of what was originally presented to the City Council as a 2018 budget from MCVFD. I want you to take a good hard look at the line for 2018. Historically, they have received the monies from previous City Councils annually every January/February. This current City Council is wanting to “renegotiate” the MCVFD contract for January 1 – December 31, 2018. I have taken a closer look at their contract, however, in the past, the county agreement was signed BEFORE our City agreement with MCVFD, which has left us with NO ROOM TO NEGOTIATE. Last year, I had many meetings where I negotiated the Severn Trent service agreement which we ended up reducing Sonoma Verde’s sewer rate by 20% that took effect in the November 2016 billing cycle. It was a win for all parties involved. 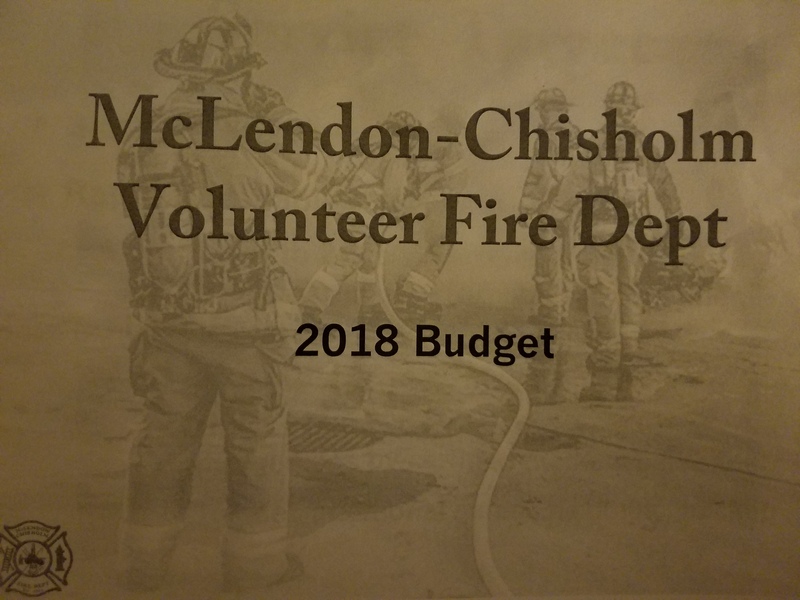 What Is The Budget Amount That MCVFD Can Operate Within 2018? Based on the October 10 City Council Meeting we reached a total payout number that it seemed that they could operate at $329,550. So we expected that the meeting to hash out the other contract details between the Fire Chief Robert Jones and Lt. Herman Larkin was going to take place before the next City Council Meeting on October 24. Mayor Pro Tem was expected to confirm possible dates between MCVFD leadership, Mayor Steinhagen, and Council Member Scott Turnbull. The date was set for October 20. Based on the correspondence that I have seen. Chief Robert Jones made demands that he only wanted to discuss money. I have no issue with those who want to serve our community either as a Fireman, EMS or Law Enforcement. But I do have a problem with this service contract’s leadership of the MCVFD. On Wednesday morning, I did send an email to Chief Jones and Lt. Larkin when I learned through once again, social media that Fire Chief Jones was not even in town. He was in Arkansas. When I saw it, I attached it to an email to him and Lt. Larkin about 8 am on Wednesday, October 25. In this email, I urged for him to contact Mayor Pro Tem Wayne Orchard to schedule by phone a meeting by 5 pm. I contacted Mayor Pro Tem at 5:15 pm to see if the Fire Chief called. And to my disappointment, Chief Robert Jones did not call, text or email. Now, is it possible that his very own member of the MCVFD was wrong that Chief Jones was not in Arkansas? Of course. However, Chief Jones could have given me the professional courtesy to defend himself or even correct what happened if either the Mayor OR the Mayor Pro Tem was in error. Each City Council Member has all been proactive in a variety of areas to find the best solution. We are absolutely open to solutions. I have personally reached out to High Point Ranch HOA Board, not to request donations for our MC City Budget. But for options for a “special assessment” to be added to their Annual HOA Dues that would go directly to MCVFD. However, the CCR’s would have to be updated to reflect this if the membership votes for it. There is a total of 4 HOA’s that could potentially be able to do this. Of course, there is many that don’t live in an HOA. It’s possible that MCVFD could apply what the Rockwall County EMS agency does or use the monies that are currently coming from the county to help assist with those expenses. Despite how many countless times the leadership of MCVFD has constantly spent their time on social media ragging on our City Council or have been the root cause of instilling fear onto our citizens about not being able to service them. I know that I have been proactive in finding ways to work out a solution. So since this Fire Chief is unwilling to follow through as a service provider to meet with the City Council, and did not meet my expectation after learning that he was in Arkansas, I am going to be proactive and ask for Fire Chief resumes of those interested in the proposal of the case study to be sent to our City Secretary. See Pg 5 – 6 in my presentation to learn more about City Owned Fire Departments. How Much Is Your Life Worth? | Why Does The MCVFD Insist On Asking This Question Or Polling Citizens For Their Opinion? Hospitals, clinics, and your very own insurance company put a price on your life. So when you hear the privately operated MCVFD attempt to spin their budget using this question it is a gimmick that has been played like a broken-record to guilt you into paying a “premium.” All of this mumbo jumbo means nothing when someone is having a heart attack, or their child has been in an accident, or a homeowner is being attacked by an intruder or their house has been burning for 10 minutes. The next time the MCVFD wants to poll our neighborhoods about a service they provide I recommend they stick to asking for a response to which chili was the best at an MCVFD fundraiser. Our EMS service, as well as, many other contractors have zero problems working with our City Council and fulfilling their contracts. They alter their schedule to accommodate ours (their customer) and provide any additional information or services we request in a timely manner. Below are excerpts from the First Edition ESD Handbook. Cities sometimes referred to as municipalities, are essentially formalized organizations created by the people who live in one area and want to share certain governmental services. This is called “incorporation.” When a city incorporates, it pledges to provide its residents with certain municipal services, such as law enforcement, sanitation, transportation, and street maintenance. Indeed, some cities offer fire and emergency services, though many do not. There are two types of cities in Texas: Home Rule and General Law. The different rules and governing structures that accompany that distinction are beyond the scope of this document. There were 1,209 cities in Texas according to the 2010 census and that number has been growing slowly each year as resident areas decide to incorporate. As you will see, ESDs can serve both incorporated portions of cities as well as unincorporated areas of counties. There are special rules that govern ESD-city interaction and cooperation between the two governmental units is essential in many circumstances. Emergency Services Districts are local political subdivisions of the State of Texas that may provide fire, rescue, EMS and other emergency services. ESDs are governed by a Board of five Commissioners. These Commissioners are generally appointed by the County Commissioners Court that they reside in. In Harris, Smith, and Orange counties, as well as ESDs that encompass more than one county, ESD Commissioners are elected by the residents of the ESD. ESDs are primarily funded by an ad valorem (property) tax that, under the State Constitution, cannot exceed $0.10 per $100 of property valuation. ESDs may also levy sales and use tax for additional funding. Learn more about ESD’s in the SAFE D Handbook. Rockwall County funds approximately 17% of MCVFD budget. ($67,500 that the City of MC gives to them annually with their payout in January/February). The $67,500 monies come from sales tax collected from the entire county, NOT property tax from houses in the county. The Mclendon Chisholm Volunteer Fire Department (MCVFD) is NOT part of the city. It is a private corporation. Approximately 50% of calls are in the city. 50% outside the city are in the fire district. There are approximately 2000 citizens that live in the city and approximately 3000 live outside of the county. Citizens that live in the city pay taxes that support the MCVFD. Citizens that live in the ETJ and county pay Zero “0” dollars for the service of the MCVFD. Looking at numerous surrounding cities, the highest Fire Department budget in comparison to the city budget is 12%. McLendon-Chisholm’s budget is approximately 28%. 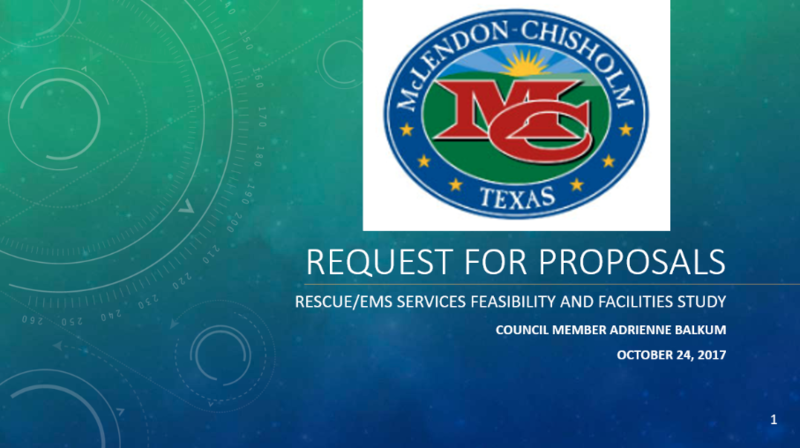 The City of McLendon-Chisholm does not own the equipment or trucks, it is owned and titled to MCVFD. Although the city has provided funds directly to purchase their assets.